Fifty years ago few people had heard of autism. Now most of us know at least one person with a child somewhere on the autistic spectrum. According to the World Health Organisation 1 in 160 children are autistic, a figure that rises to 1 in 68 in the United States. Generally manifesting between 12 – 18 months, autism is characterised by difficulties in communication, an apparent inability to form human relationships, an unusually limited range of interests and abnormal sensory issues. ...Other high profile cases include mother Mieko Hester-Perez who founded The Unconventional Foundation for Autism after discovering that medical cannabis helped her autistic son Joey. 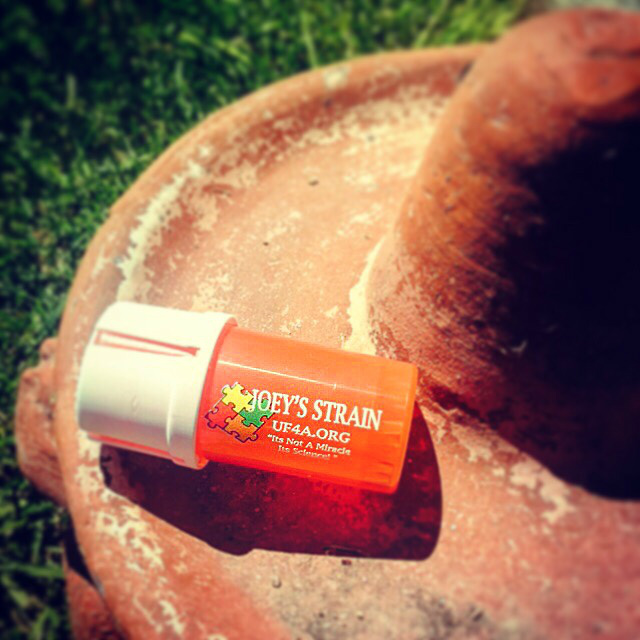 In a case mirroring that of Dravet sufferer Charlotte Figi and the strain Charlotte’s Web, Hester Perez alongside Kushman Genetics, have developed a high THC cannabis variant aimed at children with epilepsy called Joey’s Strain. Through her foundation she regularly advises parents on medical cannabis protocols for autism. Buy the Joey Strain Medtainer to promote the new patient base, special needs families. Mieko Hester-Perez specifically invokes the First Amendment rights of freedom of speech and of the press without prejudice. The matters discussed are not intended to diagnose, cure, prevent or treat any disease but are proven useful for health and life extension. Mieko Hester-Perez will always recommend when and wherever possible that a licensed local healthcare professional or group of professionals be consulted. Since 2009, this treatment has taken flight with families with children on the autism spectrum and seems to be a realistic treatment topic among circles of parents. Many pass on my information like an underground railroad system. From ages 6 years to 54 years, the results yield 15 similar results when using the entire plant. As I browse through information given to me from families in my network, given the right cannabis plan, this treatment will prove to stand out as any parents “go to” option to treat autism like systoms before moving forward with another psythropic medication. The Strains (Since currently there’s no formal regulations or medical educational componets for traditional medical professionals in place, advocates like myself and collectives I work with become “the strain source”). Dosage Management: This also depends on the perferred delivery method and serverity of the autism systoms. I always ask parents, what are your priority behaviors and symptoms, this will help form an ideal plan for your family. Families were able to introduce new food items. Families observed their child receptive in a productive educational setting. Stimming becomes limited or drastically reduced (Definition of stimming). Builds new texture tolerance (for example sand, water). In older adults, understanding the concept of helping and assisting with pride can be challenging. Autism, removes the purpose and praise but, 7 out 10 families I’ve spoken with say this type of behavior is becoming more frequent. The miracle claim becomes a fight to find its science. For example, a male 22 years of age with severe autism and spends most of his time stimming with repetitive behaviors, had watched his siblings help take groceries out of the car for months. He had been on his cannabis management treatment for a less than 30 days and his mom emailed me, her son came out of their home to the driveway and helped with the groceries and was giving high 5’s. This is another example of a person on the autism spectrum being receptive to assist in a productive chore, and two weeks later the routine has not stopped. Skeptics would like say this behavior could have been taught over time. I agree with this statement, but, cannabis provides a “window” to receive instructions that exhibits euphoria and is more likely for person on the autism spectrum to recall. In conclusion, these 15 similar results deserve to be at the top of the scientific research forum. As a parent you lost me at understanding autism and the blues that come with it. Cannabis has left myself and many other families with the joys of finding colorful personalities…isn’t that what medical science is about?